Did you know you could rent rides for events and parties? Mr. Moonwalk offers the city of Macon Ride Rentals! With our awesome selection of rides to choose from your event will most certainly be the best around! Mr. Moonwalk has the expertise necessary to help customers properly and professionally set up entertainment with our ride rentals. We will deliver, set up and pick up your rental so you can focus on hosting your event. All of our Mechanical Ride Rentals come with a friendly attendant to ensure our rides are running properly and to ensure the safety of your guests! 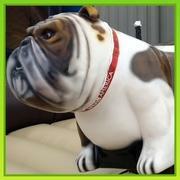 The Mechanical Bulldog adds a twist to this popular ride with a puppy face everyone will love! Kids and adults alike will laugh as they see who can hang on the longest! This ride offers a soft landing in case this dog is too much to handle! ALL ABOARD the Trackless Train that can go anywhere like magic! 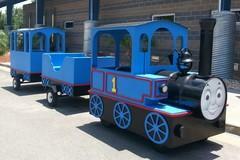 Kids will enjoy a nice ride around in this little blue caboose. You could also utilize this ride as a means for little legs to rest while enjoying your event. Let them ride from one activity to another on this train! Mr. Moonwalk not only has the best selection of unique and amazing rides for your next event,but you should check out all the awesome inflatables too!Let us help you with all your event and party rental needs. Be sure and check out our Delivery Area andContact us today for your reservations!